The next time I decided to can, I was going to teach a friend (who, not coincidentally, also went to college in said town and who was also missing the way of being in that town). We decided we were going to can anything and everything in one night, and came back from the farmers’ market with heavy bags. We did peaches, pickled beets, pickled green beans, and pickled brussels sprouts, as well as fig jam. The term “small batch” had not entered my vocabulary yet. Needless to say, we were up very late that night. Since then, I have learned a lot. And for me, small batch, is the key to success (especially with two little ones to look after). 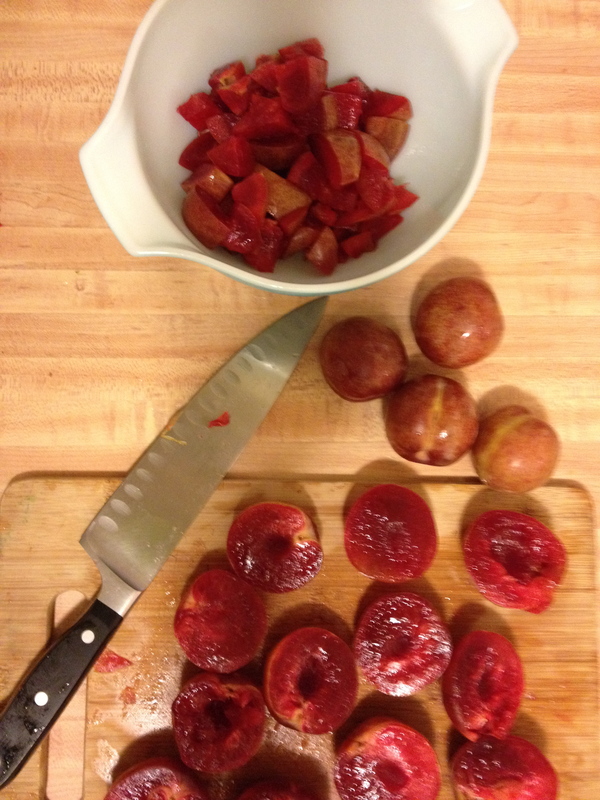 I made three batches of jam and sauce last week: pluot, fig, and hot pepper. 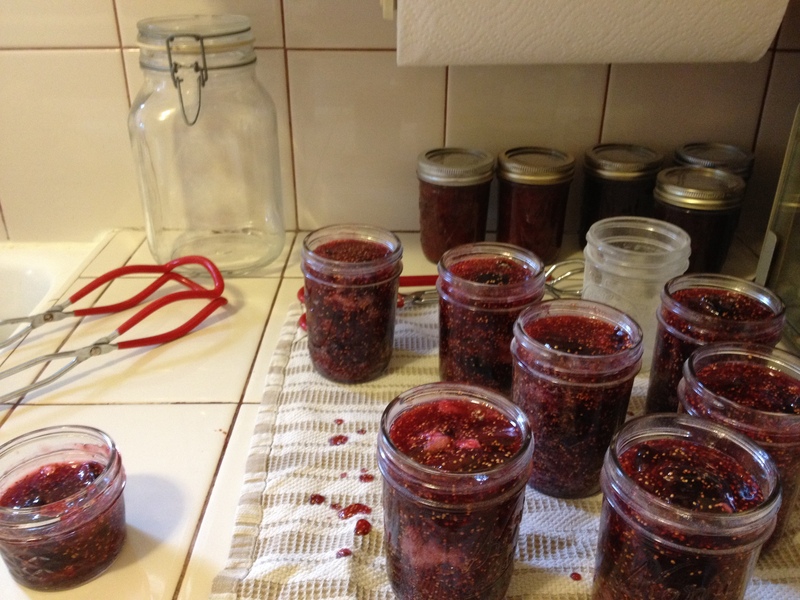 And, while my pantry is filling up with the preserves of the summer, I still feel like an amateur when it comes to jam. The actual process of canning: sterilizing, filling, and processing jars is the easy part. It is getting jam to set properly that remains a struggle. It all started with pluots. I had never even held a plout before last week. I went to Muir Ranch to pick up my first CSA box, and there sat a tray of them. One of the Ranch’s partnering farms had a bumper crop and they were free for the taking, and they had a jam recipe in the newsletter going home with me. I couldn’t resist. I sliced and removed the pits the night before, and then set to work in the morning, seeing them through to their new state. I am pretty sure I overcooked the first batch, but the second came out beautiful. It didn’t set up enough for me to call it a jam, so I said it was a sauce and called it a success. See below for the recipe. This is my third or fourth year making fig jam, so it feels easy at this point. I know what to expect. Just the figs, sugar, some lemon juice, and a box of pectin. They turned out beautiful and set perfectly. Then came the pepper jelly. I actually roasted most of the peppers first and then chopped up some fresh ones at the last minute to throw in just for fun. This is my third foray into pepper jelly. Last year the hot peppers I put in were not so hot, so I had a good tasting jelly without much of a kick. This year, there is definitely a kick, but the “jelly” is sloshing around in the jars. Looks like I am going to have to crack them open and try again. Anyone out there have any jam setting secrets? In between jam sessions I have been drying and roasting tomatoes for the freezer, and slicing and freezing hordes of peppers. I am getting a little burned out, but the tomatoes keep coming! I think I am done with jam for the season, but am going to try my hand at tomato soup. The idea of thawing and warming some up on a cool winter day is just too irresistible. I tripled the recipe and packed into sterilized jars. 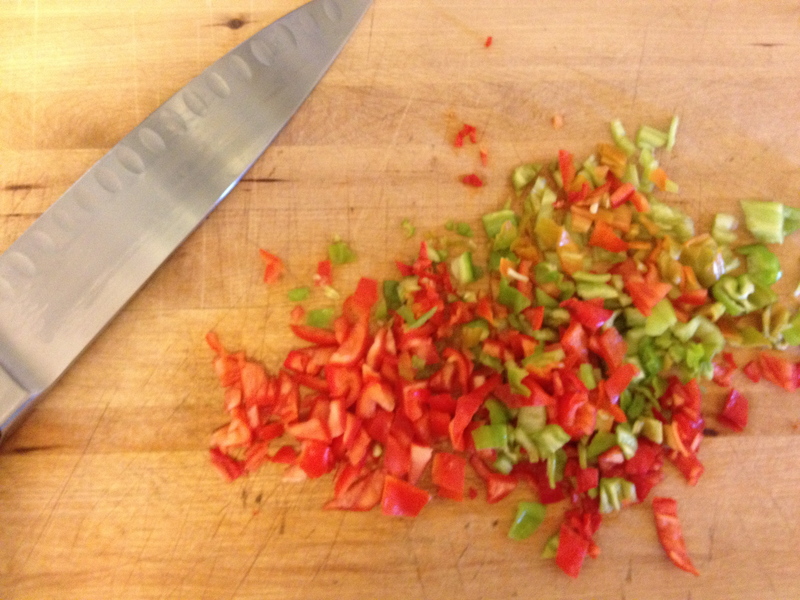 I wouldn’t sweat the runny pepper jam – It makes a lovely marinade! 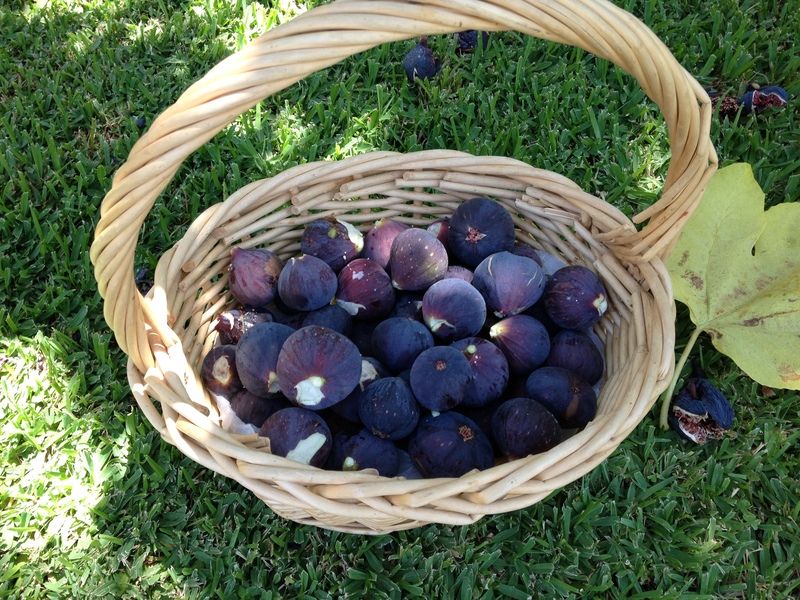 Jealous of your figs – so beautiful! Ooo, a marinade, hadn’t thought of that! We are so spoiled here in terms of figs (and citrus). This area is an old part of the city and was an agricultural area prior to becoming a suburb of Los Angeles. Large fig trees abound. So, come August, people are literally begging folks to come take figs off of their hands. They leave and awful sticky mess when they fall to the ground. I too am envious of your fig bounty. That’s a problem I would so love to have! Your canning efforts are wonderful. Too bad figs don’t ship well ;). With so many, you certainly find creative things to do with them. Good to have friends in France ;). Thanks for having a look at my blog – which prompted me to drop in and have a look at yours. Do you have access to any red or whitecurrants? These are both really high in pectin and as although I love my recurrant jelly I still have plenty of berries and I haven’t found a lot of use for the whitecurrants; however, if you cook them in as little water as possible and strain them, as if you were making jelly, you could add the liquid to other preserves which helps them set and doesn’t really affect the flavour. Have a go! I don’t have access to currants, but then again, I have never looked for them. I am assuming you mean fresh currants (not dried). Maybe I will give it a try the next time I make jam (if I can find them). Thanks for coming by! The jam looks good! I love small batches, especially with two little ones. I can do a whole batch during naptime, which feels like such an accomplishment! Wow, a whole batch during nap time. That is excellent! Unfortunately I have one who no longer naps….otherwise I might be able to do a batch at nap time, maybe :P.
I’m jealous of the figs too! YUM!